We spent an afternoon in Downtown Disney and decided to stay in that section for lunch. That was after having milkshakes at Ghiradelli and before experiencing DisneyQuest. 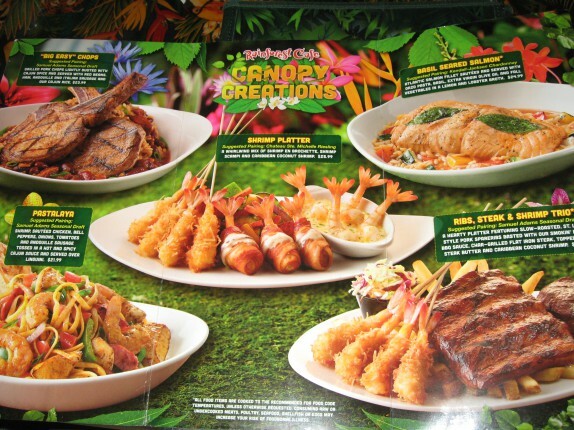 There are a handful of dining options in Downtown Disney, but we decided on Rainforest Cafe. Honestly, I had enough thinking about food by this point in the trip, and Cassie had enjoyed it in the past, so I was fine with it. 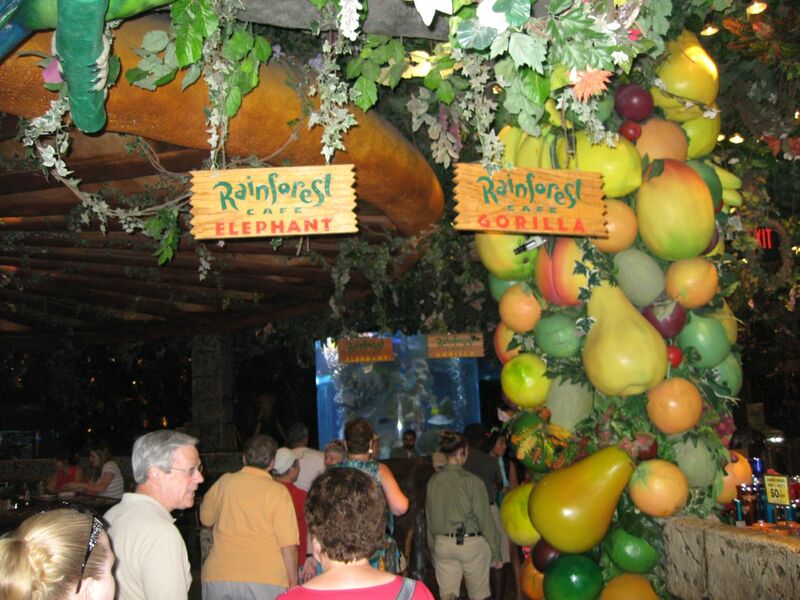 The actual restaurant is dressed up to feel like you’re in the middle of a rainforest. 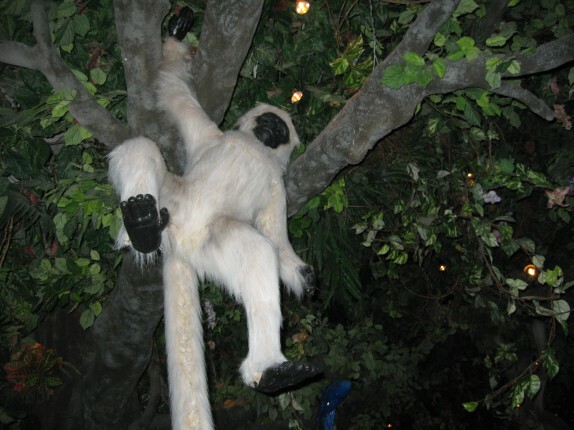 There are even robotic gorillas that swing down from trees and simulated thunderstorms every few minutes. It’s cute the first time, but it becomes obnoxious pretty quickly. The menu is as widely appealing as you’re going to get. 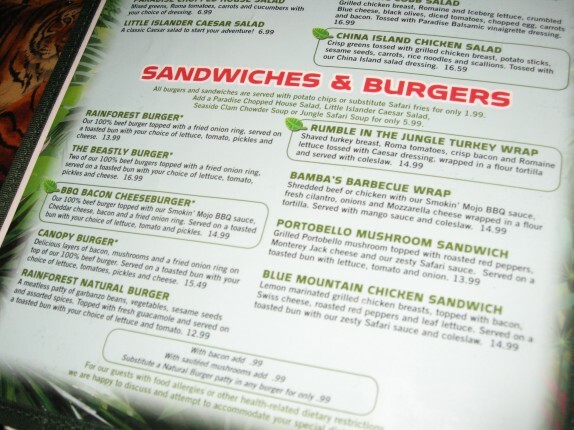 There’s literally any type of food you’d want to order from sandwiches to burgers to salads to pizza. 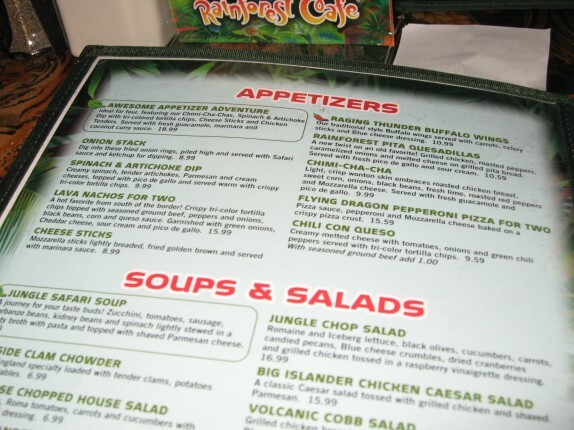 They accept the deluxe dining plan, so we were able to get appetizers, entrees, and desserts. By the end of the meal, we both agreed that we didn’t need dessert. 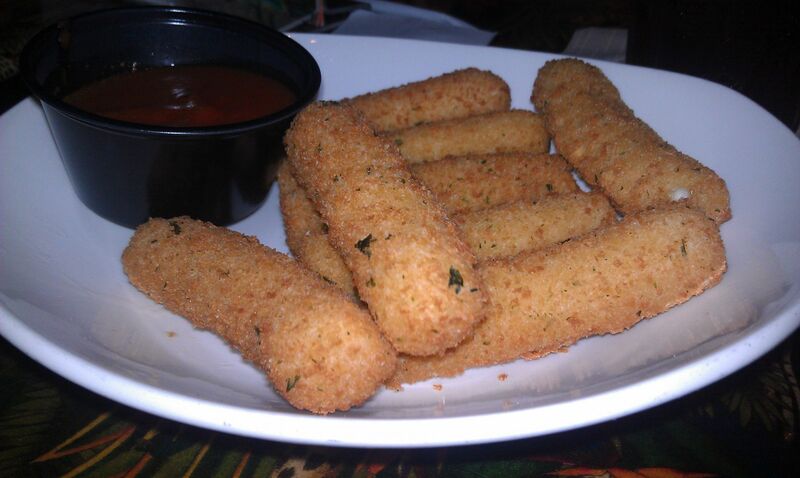 served with marinara sauce); sometimes that’s all you want. These were your run of the mill factory cheese sticks. In fact, it’s possible these came off a Sysco truck because I saw one backed up to the restaurant earlier in the day. They were fine, and the portion was borderline ridiculous. 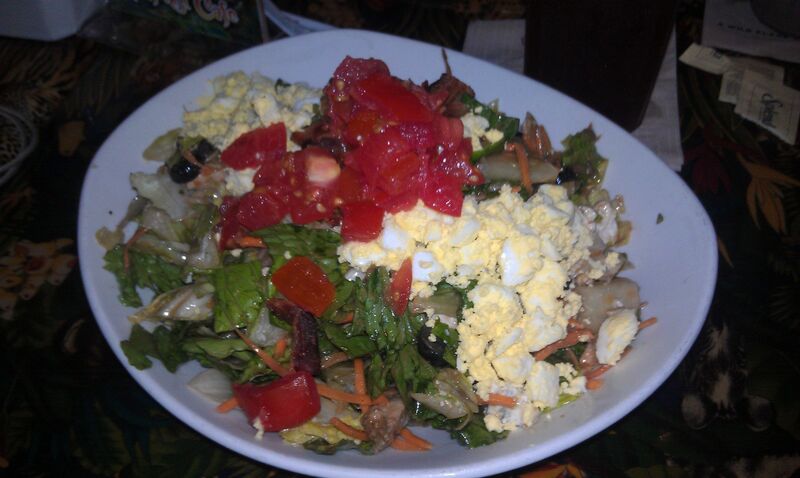 As an entree, in an effort to redeem Disney for the travesty of the Cobb salad at the Hollywood Brown Derby, I ordered their rendition of the salad, the Volcanic Cobb Salad (Grilled chicken breast, Romaine and Iceberg lettuce, crumbled Blue cheese, black olives, diced tomatoes, chopped egg, carrots and bacon. Tossed with our Paradise Balsamic vinaigrette dressing). 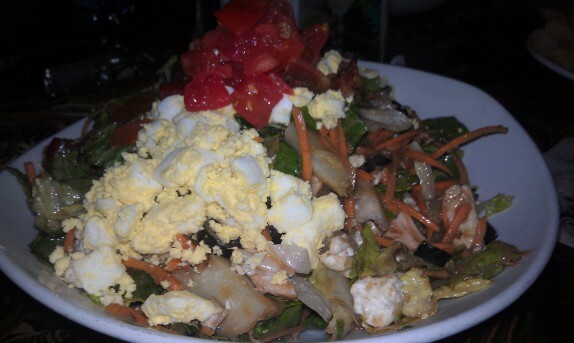 It was marginally better than the salad I had at the Brown Derby. The lettuce was drenched in dressing, and the chicken was really dry. There was quite a bit of bacon and egg, and the tomatoes were actually very flavorful. There was so much on the plate, however, that I don’t think it’s possible that anyone could finish it. I picked at it for a while and barely put a dent in it. For dessert, they were pushing a sparkling volcano dessert which actually wasn’t included with the deluxe dining plan. Like I said, we totally skipped dessert because there’s really only so much you can eat. Overall, I wouldn’t say this was a stellar experience. It was just an ok experience. As we were entering the restaurant, we saw a woman posing for a picture in front of the sign for the Rainforest Cafe with her thumbs down. 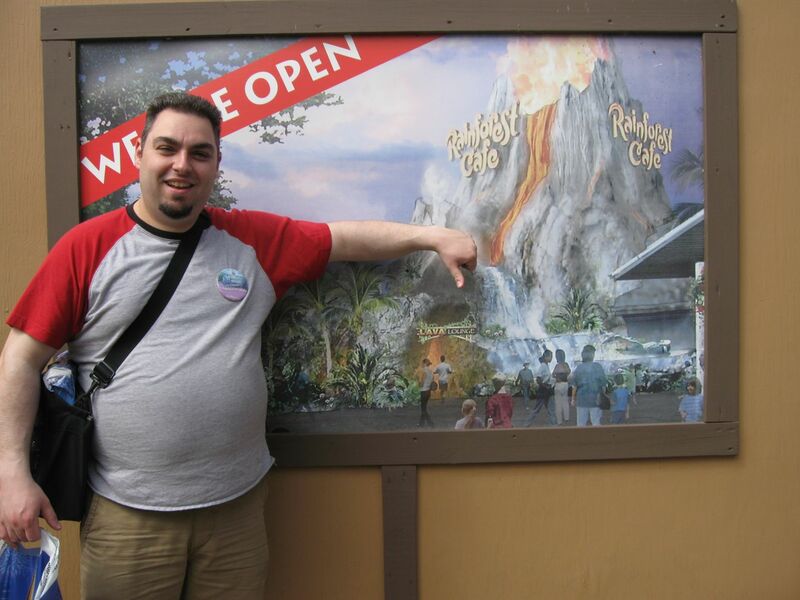 That didn’t bode well for the experience, but I waited until I experienced it before I took my own picture. 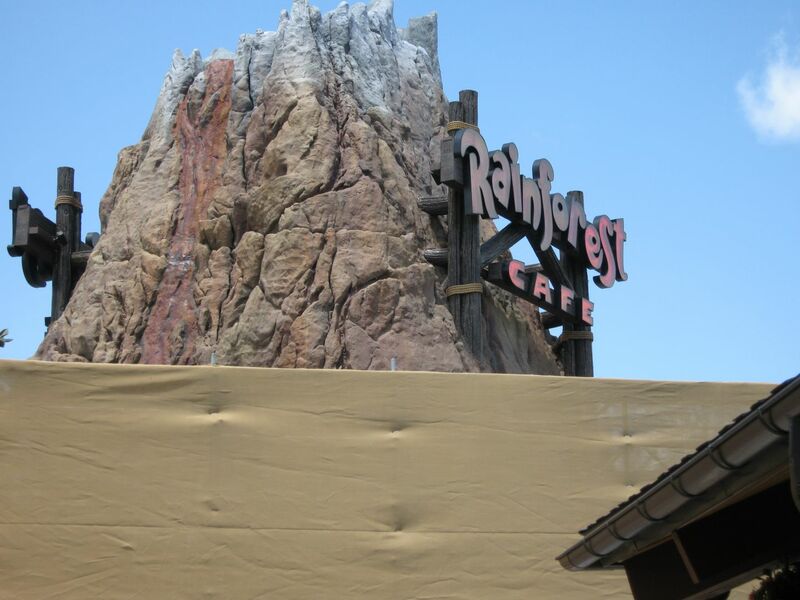 I’m not giving a full thumbs down, but I’m sure there are more worthwhile dining options elsewhere in Downtown Disney. Looks like they just grind the orders out and plate them haphazardly…that must be a huge account for Sysco…I would have been disappointed, too…are the gratuities included on the dining plan? Gratuity is not included. There’s a note on each receipt reminding that you should tip on the total of the meal. 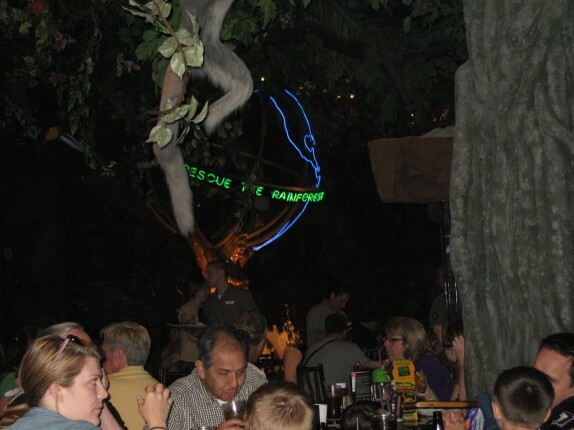 Downtown Disney is really not that great for food.. We usually have dinner there our first night because we don’t want to waste a lot of time there. We have yet to have an experience that wasn’t mediocre. We had intended to try Bongos this time, but since we’ve discovered there were Extra Magic Hours at EPCOT the night we arrive, we opted to add another day ticket (for the low low price of $30.) and head to Downtown for a Sundae after dinner at the World Showcase. In a pinch, I would recommend the Earl of Sandwich.. at least it’s cheap.. also I hear good things about Wolfgang Puck Express.